Passengers sitting in planes on the runways of Heathrow Airport outside London on Thursday morning must have wondered what the problem was. The sky above was clear and blue, yet the British government had closed the country's entire airspace, grounding all flights at five airports and disrupting the itineraries of tens of thousands of travelers  including those whose journeys originated elsewhere in Europe, North America and beyond and who would have only passed through Heathrow, Europe's busiest airport and a major international hub that handles more than 1,200 flights and 180,000 passengers per day. Airports were closed throughout much of Western Europe and Scandinavia as well. "The sun was shining and the sky looked normal," says Leah Heifferon of New York City, whose flight from JFK was one of the last to land in Heathrow before the airspace was closed. "You couldn't see anything wrong from the ground." What passengers couldn't see was the eruption of the Eyjafjallajokull volcano in Iceland  more than 621 miles (1,000 km) from Britain  which had spewed a toxic plume of ash high in the air on Tuesday night. Prevailing winds had pushed the ash over much of Europe by Wednesday, and while it was too high (up to 36,000 feet) and dispersed to be easily visible, it still posed a serious hazard to air travel. Volcanic ash, which is made up of sulfur dioxide, carbon dioxide and hydrogen fluoride, along with fine silica particles, may not block pilots' sight lines, but its chemicals can wreck sensitive aircraft engines. It can also clog an aircraft's ventilation holes, causing engines to stall. How serious is the threat? 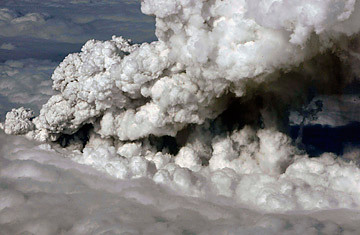 It could be deadly: in 1982, a British Airways flight from Kuala Lumpur to Perth, Australia, passed through an ash cloud that had just erupted out of a volcano in Indonesia. One by one, each of the engines on the jumbo jet shut down, and the plane began to dive toward the ground. Disaster was averted only when the pilot managed to glide below the ash cloud, clearing the engines; the flight was able to make an emergency landing in Jakarta. British airspace will be closed for all non-emergency flights until at least 7 a.m. local time on Friday, by which time authorities hope the ash plume will have been blown away by prevailing winds. But if the volcano in Iceland continues to erupt  as has happened in the past  new clouds could be produced, further disrupting air travel throughout the North Atlantic. When Eyjafjallajokull last erupted, in 1821, it remained active for an entire year. Worse, the current event could trigger the eruption of nearby Mount Katla, which is even more powerful. If Katla were to explode, North Atlantic airspace could be affected for months. It could even impact the climate: the 1991 eruption of Mount Pinatubo in the Philippines threw so much ash into the atmosphere that it reduced the amount of sunlight reaching the planet, cooling the world by about 0.5°C over the next two years. And that's something everyone would notice, even on a clear day. Read "Ash From Volcano Grounds Flights Across Europe."